Keeping the public informed about crucial changes during the I-4 Ultimate Improvement Project — the $2.3 billion public-private partnership rebuilding and widening a 21-mile stretch of Interstate 4 — is an enormous challenge by itself. When those changes occur in high-traffic areas in the heart of Orlando, the nation’s fourth-fastest-growing metro area, complications mount and the chance of public confusion rises. Yet that was precisely the task facing the Florida Department of Transportation (FDOT) and Global-5 ahead of a long-term closure of Hughey Avenue. Located on this downtown thoroughfare are the federal courthouse, county public schools administrative offices, Florida A&M University College of Law, and the Amway Center, home to the Orlando Magic NBA basketball franchise. A multilayered public information campaign designed to overcome those obstacles resulted in a well-informed community, a safe motoring public and a prestigious national award. 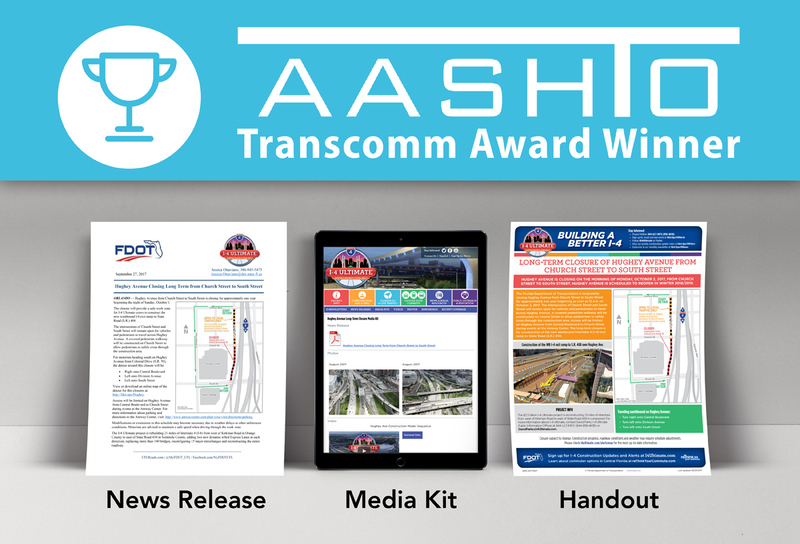 The news release and online media kit Global-5 developed with FDOT won a 2018 American Association of State Highway and Transportation Officials (AASHTO) TransComm Skills Contest award. The annual contest is recognized as the standard of public relations excellence among state departments of transportation. The news release and media kit generated 37 media mentions, including coverage by major broadcast and print news outlets in Central Florida. It reached an audience of more than 3 million in five days. This is FDOT’s second AASHTO TransComm Skills Contest award for the I-4 Ultimate project. In 2015, FDOT and Global-5 won for developing the project website, I4Ultimate.com.